Do you need a natural microdermabrasion formula? If so, the Honeyskin Organics’ Organic Microdermabrasion Facial Scrub Exfoliator might be perfect for you. It combines a gentle fruit acid with superfood botanicals to renew dull-looking skin. It is suitable for all skin types as it matches the pH level of your skin at 5.5. It can even be used to help relieve several skin diseases, like rosacea, eczema, and psoriasis. The walnut shell powder is gentle to the skin yet effective in removing dead skin in your pores. Also, the Manuka honey replenishes the skin effectively, without irritation. What makes this product gentle is its lack of any harsh chemicals that might irritate your skin; it only uses natural ingredients. The product is great in for chronic skin diseases like acne, rosacea, and eczema. Unlike other facial scrubs that aggravate skin diseases, this organic face scrub reduces the inflammation, redness, and pain thanks to Manuka honey and Cehami. It speeds up the healing process of skin diseases by removing dead skin away from the pores. This face scrub uses walnut shell powder to remove the dead skin from your skin. The microbeads are positively charged making it easier to remove toxins from your face. This product also uses gentle fruit acids to reveal a more radiant skin. Plus, it uses aloe vera barbadensis as a base, unlike other face scrubs that use water to cut costs. This face scrub has a size of 236 ml, which is almost four times the size of other regular face scrubs at the same price. At around $30, this is a great bargain considering how much face scrub you can use. As recommended, you only need to use this product twice a week. With its size, it might be safe to assume that it can last for several months. A few users noted that the consistency of this face scrub is a bit watery. This makes it difficult to hold the micro-beads together. You shouldn’t worry about its watery consistency because the liquid itself is built with natural exfoliating agents. If you find this a bit of a problem, you may try other brands which offer a thicker consistency like the Dermafresh Face Scrub from Zenith Skincare. Some users reported that there are only a few scrubbing particles that they can find in the product. This might be because this formula is meant for sensitive skin and using more microbeads would aggravate chronic skin conditions like rosacea and acne. If you consider this a deal breaker, you may buy other brands which offer abundant scrubbing particles like the Best Advanced Microdermabrasion Scrub from Candid Essentials. A few customers noted that this product is too gentle as a microdermabrasion facial scrub. Since it is designed for sensitive skin, you would expect the micro-beads to be gentle. However, if you find this a letdown, then you may try other brands which have rougher microbeads like the Organic Exfoliating Facial Sugar Scrub from Bee Friendly Skincare. Honeyskin Organics’ Organic Microdermabrasion Facial Scrub and Bee Friendly Skincare’s Organic Exfoliating Facial Sugar Scrub both use natural ingredients as exfoliating agents. While Honeyskin Organics uses walnut shell powder, Bee Friendly Skincare uses organic cane sugar. Honeyskin Organics comes in a larger package than Bee Friendly for almost the same price. In comparison to the Dermafresh Face Scrub from Zenith Skincare, the Organic Microdermabrasion Facial Scrub from Honeyskin Organics is less expensive and larger in size. While Dermafresh uses aluminum oxide crystals, Honeyskin Organics uses walnut shell powder. Honeyskin Organics is also better than the other brand in terms of gentleness because it uses more natural ingredients that don’t irritate the skin, like Manuka honey. 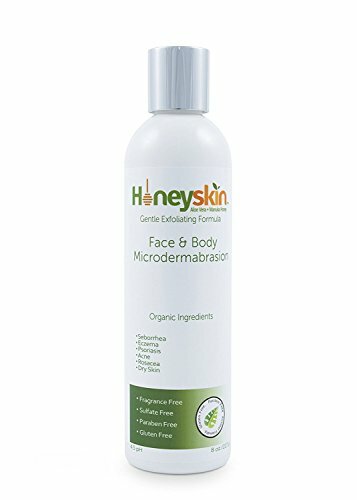 If you have sensitive skin or you’re suffering from chronic skin conditions like eczema, rosacea, and acne, the Honeyskin Organics’ Organic Microdermabrasion Facial Scrub Exfoliator might be suitable for you. Although it can be watery in consistency, this is made up for by its great natural ingredients like Manuka honey, aloe vera barbadensis, and Cehami. Some recommended products may use affiliate links. thebestfacescrub.com is a participant in the Amazon Services LLC Associates Program, an affiliate advertising program designed to provide a means for sites to earn advertising fees by advertising and linking to Amazon.com. Amazon and the Amazon logo are trademarks of Amazon.com, Inc. or its affiliates. Copyright 2016 by The Best Face Scrub.